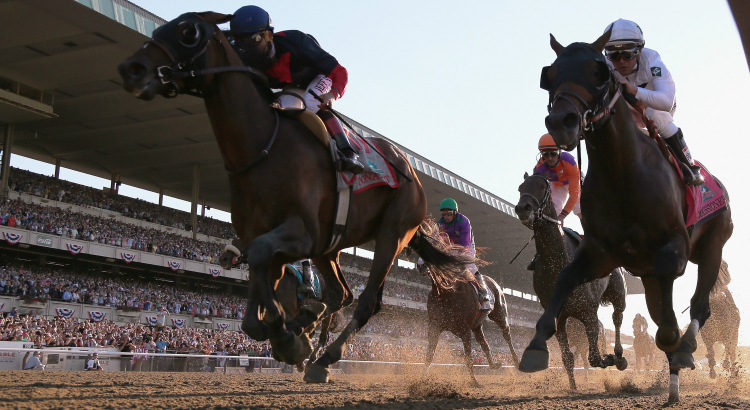 Every June, the Belmont Stakes, final jewel in horse racing's Triple Crown, takes place at Belmont Park. The Belmont Stakes at 1 1/2 miles is the longest of the three Triple Crown races. American Pharoah made history, winning the 2015 Belmont Stakes to secure horse racing's first Triple Crown in 37 years. The 1 1/2 mile race, known as the "Test Of The Champion" and sometimes as the "Final Jewel" in thoroughbred horse racing's traditional Triple Crown series. American Pharoah became the first horse to win the Triple Crown since Affirmed in 1978. As the 12th Triple Crown winner, American Pharoah ran the race in 2:26.65 which was the sixth-fastest of all time and the second-fastest (following only Secretariat in 1973) amongst Triple Crown winners. American Pharoah, ridden by jockey Victor Espinoza, was leaning back in the starting gate when it opened and was a touch late at the start, but he soon pulled out to an early lead, which he maintained for a gate-to-wire win. Justify beat the odds and joined the Triple Crown winners elite. Justify led for every step of the grueling 1 1/2 miles of the 2018 Belmont to win the 13th Triple Crown in horse racing history, just 3 years after the last one. Because Justify’s victory came so close on the heels of Pharoah’s, it’s instinctive to compare them. The trainer of both Justify and American Pharoah becomes just the second to ever win the Triple Crown twice; “Sunny Jim” Fitzsimmons also did it twice, with Gallant Fox and Omaha in the 1930s. 2003 Empire Maker 2:28 1/5 Juddmonte Farms, Inc.
1998 Victory Gallop 2:29 Prestonwood Farm Inc.
1981 Summing 2:29 Charles T. Wilson Jr.
1975 Avatar 2:28 l/5 Arthur Seeligson Jr.
1944 Bounding Home 2:32 1/5 William Ziegler Jr.
1922 Pillory 2:18 4/5 R. T. Wilson Jr.
1890 Burlington 2:07 3/4 Hough Bros.
1888 Sir Dixon 2:40 1/4 Dwyer Bros.
1887 Hanover 2:43 1/2 Dwyer Bros.
1886 Inspector B 2:4l Dwyer Bros.
1884 Panique 2:42 Dwyer Bros.
1883 George Kinney 2:42 1/2 Dwyer Bros.
1876 Algerine 2:40 1/2 Doswell & Co.
1868 General Duke 3:02 McConnell & Co.